Google has been sending out messages saying that several of their APIs are going to be discontinued (for example, the Document List API). As a result, I tried to modify my custom Google Spreadsheet-populating PHP script to use the new Drive API. After way too much wasted time, I discovered that the Drive API can create sheets and read their metadata, but can’t add rows — for that we can keep using the Spreadsheets API. I was successful at converting the authentication portion of my script from the old ClientLogin to OAuth with a Service Account (the script runs behind the scenes of a web site and populates a Google spreadsheet that the web site user has no knowledge of). It wasn’t as simple as I’d hoped because the Google-provided PHP client for the Drive API doesn’t know about the Spreadsheets API. I had to dig around the PHP libraries to piece together authentication codes and Google_Http_Requests. Then Google changed the PHP client to use Guzzle, so I recently made that change. So, if anyone else out there is interested in the combination of PHP, the Spreadsheets API, and OAuth with Service Accounts, this could save you some time. Click “APIs” in the left column, then click “Drive API” and then “Enable API”. This is not needed for the Spreadsheets API, but you might want to use the Drive API also. Click “Credentials” in the left column. Share the Google sheet with the email address from above (give edit permissions). Then I ran ‘composer require google/apiclient:^2.0’ as specified in README.md to install the dependencies. To learn more about the Guzzle PHP HTTP client used in the client, click here. If you want to do more with the Sheets API or run into cURL error 60, please check out my other Google Apps posts. Let me know if any of this doesn’t work or doesn’t make sense! This entry was posted in Google Apps, webdev on April 16, 2015 by karl.kranich. Code returned from below code is 400 but should be 200, is there any specific reason for this? above article is very useful and worked perfectly. Now I want to update / delete particular row from google spreadsheet. can you help me for this? I think you can take the HTTP examples and adapt them to PHP. I am trying to connect with my file while using this piece of code but I am getting “200” error on blank page. I have a spreadsheet in the drive which is shared with the service account’s email address. Can you please suggest if I am doing anything wrong with the code or configuration. A status code of 200 usually indicates success. Are you trying to read or write? If you’re reading, maybe the response body actually has the data you’re looking for. I am trying to update a sheet with the entry of a new row each time the script is called and when using this code it shows 200 on screen but the sheet is still blank and its not updated at all. Do you think there is any error or miss-configuration I did? I checked with HTTP example. Now I want to update particular row from google spreadsheet. I used quert string to get that particular row but not rowId and etag. How I can get that rowId and etag to update particular row. Can you please help me. Sorry for my original reply — I was mixing up some stuff. I have read that you will get that error if your column names don’t match what Google expects. You can’t just use the column names that you see in your spreadsheet. First try changing them to all lowercase. If that doesn’t work, do a GET of the list feed and see what Google expects for column names. My example uses list-based feeds for manipulating Google sheets. I just learned that these require that the first row of the spreadsheet is column headers (I just lucked out in that mine were always like that). Also, when you create the XML to write data to a sheet, the column headers need to be a lowercase. If you aren’t sure what to use for column headers in the XML, do a GET request for the list feed and find the column headers in the output. I was already seeing the id values before, and now I also see the etags. below is the xml which I passing to execute, can you please check and let me know what is the issue. Thanks a lot. It worked like charm! But I have a question. Your script inserts in only first worksheet. But How to insert in specific worksheet ? The code in section 3 of my gist with the URL https://spreadsheets.google.com/feeds/worksheets/$fileId/private/full, you should get back a list of URLs to edit each of the worksheets. You need to parse that and find the link for the worksheet you need. Karl , you have an excellent article , everything works , that’s just my problem – I do not know how to get such a particular file on a particular piece of the value of specific rows … tell me how to do it , and I completely confused. Thanks for the early. Tell me more about what you want to do. Do you want to read a row from a spreadsheet? Or edit a row? Sorry, Kamil, I don’t know. Since it’s timing out, I wonder if it could be problems with your network connection. But if you’re not having other problems, perhaps it’s some kind of an API limit that your running into. I don’t know what kinds of limits Google has. Follow the format on the post body, First you must have column fields on your worksheet not empty. Between tag is the data you want to insert. I have provided example code in the github gist. Section 4 will add a row to a spreadsheet after you’ve figured out the authentication and the file id of the file that you want to edit. Thanks for this great source. It looks very promising and simple to interact with google. Can you pl help in getting past this? I don’t know how to troubleshoot oauth issues, but you are the second one to report this error so I’ll try to look into it. Thanks a lot for your kind and quick response. Have been searching on this on the net thru out the day and realise it is got to do something with recent changes at google side. We are trying to setup up a handler to receive data and store it in google sheets for our ministry campaign. Kindly see, if you can help, when things permit you. Praise God! Got past the issue. The bug was an extra space ‘ ‘ within the clientid and email literal strings. Exploring the wonderful code now. In your Create the Service Account section, the fifth step, OAuth section, do you mean “OAuth consent screen” ? I could not find where to click “Create new Client ID”. Thanks for pointing that out. It looks like Google has changed the way the Developer Console is organized since I wrote the instructions. I’m walking through the steps and updating the post right now. Check back in an hour or so. Thank you so much for your quick reply. The final step of the section Create the Service Account, client id is the same as “certificate fingerprints”? No — if you click on the email address on that screen, you’ll get to a detail page that shows the client ID. Thank you very much for sharing your knowledge. This tutorial saved me a lot of time. You’re welcome! Check out part 2 also. In section 3, I could get the whole data from a spread sheet. What should I do if I only want data from a particular row ? I would like to know if there is any way to fetch the first cell of the first row in the sheet, I do not know why in my sheet, the cells of the first row will be treated as column name. Thank you so much for your great help, I have another question. If multiple sheets share a same fileID, what should I do to specify one of them? They have different gid. Hi, Have Implemented Code as you Instructed. Have granted Permissions as mentioned here. But having Issues with Authentication – getting 401 Unauthorized. Be sure that you’re connecting to https (secure) URLs. Which section of the code is breaking? And You have Done a Great Job. It Helped me a lot. I am getting following output. Cool — glad I could help! This is brilliant, thank you for sharing it. Probably because I have an older version of PHP?? Thanks for the feedback and tips, Andrew! I’ve been wanting to look into JSON handling of this stuff. Hi Karl, thank you for the useful information. It looks like Google has changed the API client since I wrote this. I will try to figure out how to get my code to work as soon as possible, but I’m not sure when I’ll have time. That’s how I did it last week and it worked just fine. Thank you Sofia, it worked with composer. Just wanted to drop this here also: https://developers.google.com/google-apps/spreadsheets/?hl=en#adding_a_list_row It does mention an empty row, but google apps script would probably be your best bet, as karl.kranich mentioned. I just updated the instructions for the new installation method and HTTP library. Google made major changes to the PHP API Client! Thanks for your efforts and contributing your code. However, I am having an issue in running this code. I could be a lame because I haven’t seen anyone else having this same issue so far. I am trying to run this apitest.php from within the XAMPP setup. I have changed the path of autoload.php (which was in /src/Google/autoload.php) and nowhere I have seen where you have given the path for service_account.json file. I have created a similar spreadsheet file, updated the ID, Shared the sheet, service account email id. but still, it isn’t working, I am getting the following errors while running apitest.php in browser. Can you suggest me what I am doing wrong? Have you tried my new instructions and used Composer to install the dependencies and create the autoload file? If not, give that a try. I updated the instructions just a few days ago. If you’re using Composer and the new instructions, let me know. What I am not able to understand the part where you mentioned, use composer to install dependencies and create the autoload file. One more thing, ..and yes as per your instructions in blog, I moved to /usr/local/bin/composer too. After reading your comments, I run that command again and it create composer.phar in /Applications/XAMPP/xamppfiles/htdocs/google-api-php-client/composer.phar location also. So, now I have it in both location. Its sorted. I run, composer install and I have vendor folder with autoload created in it. Another thing I am not able to understand it, you mentioned to update the path of service-account.json, but in your code, I don’t find any line where I need to update the path to service-account.json file, or any instructions on where should I save service-account.json in order for you script to read it . Sorry that I didn’t explain it clearly. When you are in the Google Developer Console and request credentials, you download a .json file. You can call it whatever you want, but I named it service-account.json when I downloaded it from the Developer Console, and then I had to tell my php script where I saved it. yes, no your explanation was clear, what I want to understand which line in your script actually takes the path of service-account.json file as an input. Found it, it’s in examples/templates/base.php. Stupid of me. Yes, just line 44. I didn’t have a path because I put service-account.json in the same directory as my apitest.php file. I haven’t seen that one. Maybe you downloaded a P12 file instead of a JSON file from the Google Developer Console? I would download the JSON authentication file again from Google. I think I got that error when I didn’t updated my service-account.json file path. If you have downloaded json file as Karl mentioned and if you are still getting this error message then you can make sure if you have updated the complete path of service-account.json in your examples/templates/base.php file on line 105. Thanks, Ishan. I didn’t have to edit base.php, but I’m glad that got it working for you! Somehow the putenv command in apitest.php is working for me without touching base.php. Hi Karl, variable $accessToken shows up in the code undeclared before. Where do I get this from? The code works for me except the Section 4 to put data into the spreadsheet. I only see $accessToken in section 5 (edit an existing row), and it was left over from a previous version of the code and isn’t needed anymore. I just deleted it from the gist. If you just remove that from the headers, everything should work (assuming you’re working with the latest version of the PHP API client and my script). I’m guessing that Guzzle isn’t able to verify Google’s certificate. Check out this page: http://stackoverflow.com/questions/24923604/guzzle-curl-error-60-ssl-unable-to-get-local-issuer. I would temporarily disable certificate verification just to see if that fixes it. If it does, I’d then try to figure out how to tell Guzzle about Google’s certificate chain. Thanks Karl, I disabled certificate verification in guzzle ringphp curlfactory and it worked perfectly so it might be that Guzzle isn’t able to verify. Right. But it works for others, so there must be some certificate-related files missing on the machine you’re developing on. That would be the next thing to check. Perhaps the Guzzle site offers some clues. I also found a post where a Google person was admitting that the diagrams in the execution API documentation show a service account authentication flow, but he said that doesn’t work. I was trying to implement your tutorial and as you and others have said, I am also getting the same issue. Did you found any other workaround to this problem? If you’re talking about the SSL certificate problem, I have not been able to reproduce that error. What OS is on the machine getting the error? I’ve followed all the StackOverflow tips and still don’t have it working on Windows 10 running WAMP. Bernie, after the holidays I will try to reproduce your error on a Windows 10 machine. On my Mac, it all just works. Any idea on what I am doing incorrectly? I might get away with sharing to anyone with the link for the current project but it is not a good solution. Please help. i want to put underscore to <gsx: header like oreder_id. i tried but error come. can you please any idea ? Not sure what is going on. I would try recreating your service account in the developer console. Hello karl, I tried with underscore but not write data on google spreadsheet and error comes. Currently i need underscore please however give your solution? Thanks Karl. Can you explain bit more? Do we want to use ? Do we want to use ? Please see http://www.dvteclipse.com/documentation/svlinter/How_to_use_special_characters_in_XML.3F.html and other pages like it. What I am looking to do is, use the underscore as part of the xml tag, not part of the xml value. My excel sheet column name has underscore, which cannot be removed, as it is being used by another application. tracking_number and order_id are those column names. But when I use gsx : tracking_number, it doesnt work. Thats where I am stuck. Hi Karl and everyone following this thread. the output of section 3 is an object with my spreadsheet, how can I iterate on that object, I need to read rows and cell, I tried to cast it to an array but it did not work. My simple needs have been met by searching the output with regular expressions. You should be able to use XML utilities to parse the output, though. Do you have any update for my problem regarding underscore? Even in the tag, I think the special code should work. Have you tried it? Also, I would look at how it’s represented in the output when you ask Google for your spreadsheet data. You should be able to mimic that. I created a new column in my spreadsheet called col_c. When I use my script to request the XML data, the tag is gsx:colc. Have you tried it all lowercase with no spaces and no underscores? Hi Karl, thank you for your effort!! By few days I have trouble with Google Drive api. I think its an error of some libraries to update. If I would like update GuzzleHttp to 6.0 version with composer, could you help me, please? I’m sorry, but I have not really figured out Composer yet. I just enter the commands that Google tells me to install the dependencies. I’ve updated my example code to work with the updated Google PHP API client and Guzzle 6. Hopefully it’s helpful to you! Now i want to delete all records in googlespreadsheet. please can you explain? You could also use the Drive API to delete the whole file and create a new, empty one. Thanks Karl for your Quick Reply. I just added a new section to my example code that parses the XML, and you could use that to populate an array. I think you can also tell Google to return the spreadsheet data as json, but I haven’t tried that yet. Please guide me how can I update a paricular cell value of a row using status condition. i.e. I want to update status field of the sheet ‘complete’ or ‘incomplete’ in the time of autonomous data import in the database. Please help me with the example script. The methods that I have tested all use the list-based feed. This is where you have a header row and then rows of data, and you can only edit the rows of data. I will try to put together some example code soon. Many many thanks for your response. “400 Bad Request response: Invalid query parameter value for cell_id”. Once Again thanks to give me a bit of your precious time. Hopefully I will have some time to try it this week. I’ll let you know if I figure it out. I have installed composer in my system but when i ran ‘composer require google/apiclient:^2.0.0@RC’ as specified to install dependencies. it give me this error that “The package is not available in a stable-enough version”. The full text shown to me is as below. there may be a typo in the package name. Please help me as it is argent. Thanks for nice instructions. Unfortunately i have som problems with downloading the json key-file when i creating my Service account. Everything seems to work when i creating a project and the service account, and the pop-up-window with the private key also says that it worked and that a file was saved on my computer – but i can’t se any. Do you know what i’m doing wrong? I don’t know what’s going on there — it’s just a normal file that should be in your downloads folder (or wherever your browser saves files). Okey, I don’t know either. Thank you for your answer! Is it possible to create your own json key-file? I mean, i know what name it should have and where to store it, and i guess i can find the rest of the information at console.developers? If it’s possible, it would be nice to see how the file should look like, is there anyway/anywhere to see that? This codes give me the string response.I want data as an array so, I will filter desired result from the section.and show in our form. $resp = $httpClient->request($method, $url, [‘body’ => $postBody]); request method does not exist, this line is from you apitest. Were you able to install the dependencies with composer? Yes I think so! Is there a way to check if I did? If it worked, your project folder should contain a folder called “vendor” with an autoload.php file that was created by composer and a bunch of folders including “guzzlehttp”. If that’s all there, I don’t know what to suggest. thanks for the work. Keep getting the 401 message, stating that my access to the spreadsheet was denied. At first I couldn’t figure out the error, I tried a different private key, different service account (different mail).. well it was driving me crazy. I was an hour in when I decided to take a look at the actual class and found what has been missing. For some reason the Google API creates an access key, which is not tied to the given service account email, so it appears as “anonymous” when accessing the spreadsheet, therefor the drive denies the access. Long story, short: Setting the “setAuthConfig” fixes the issue. Maybe you would like to integrate it in your gist to help a few others. Thanks for the info, Dennis! I don’t know why that’s happening for you and not for me, but I’ll incorporate that into my gist asap. I have 2 ideas what might be the issue. First one: I created more than one service account and the API didn’t know which mail to use. I think it’s unlikely since the keys are connected to the accounts. Second: We are using Google Apps for Work, maybe the guidelines are different then they are for the regular Google Drive. Wow and Thank you! In 2 hours, I was able to do what I have been working on for several weeks. Thank you. The comments about the column headers is very important. I use CamelCase column headers without space in the spreadsheet and all lowercase in for accessing the columns. The examples in the apitest.php code walked me through the various CRUD elements (without delete). I don’t know why Google could not provide the same tutorial. I ran their tutorial and was able to access a gcalendar, but not a sheet. Hey Karl! You helps me a lot. Thank you. Thank you, Maks! I will do that asap. My spreadsheets (including a new one that I just created) still have od6 as the identifier for the first worksheet. I’ll just leave things the way they are, since I already tell people that they need to look at the XML output of the “list worksheets” section to get the correct ID. Can you please help me to move ahead? This page is a godsend! Thank you so much. You’ll need to either upload the whole folder or run the git and composer commands on your server to build the folder structure. the other ones in the root of my magento. It doesn’t seem to manage to get to the access tocken. What could be thank you!! I’m guessing that your spreadsheet doesn’t have headers in row 1, or there is a problem with the XML that you’re sending. Does your spreadsheet have a header row? I don’t know anything about magento, but I will say that your folder structure is different from mine: my “vendor” folder is not inside my google-api-php-client folder. And my access token is in my main project folder, which is where my vendor folder and google-api-php-client folders are. Yes Karl! you made my day! I had typo in the column name. Now everything works. $includegoogle = Mage::getBaseDir(). ‘/google-api-php-client-2.0.0-RC5/examples/templates/base.php’;? thank you !! If that’s how it came from Google, then it should work. I’m sorry, I don’t know what to try next. Several years ago I did that with a Perl script by putting a line feed (“\n” or ascii 10) in the cell data. Karl, I have tried \n but it simply converts to text, char(10) would probably work but how to insert it? Sorry, I don’t know. Let me know if you figure it out! You can definitely use the examples on that page – my work was basically to get the HTTP examples on that page to work with the Google-provided PHP client. Build a URL following the example of the “Send a structured query for rows” section and then send the GET request via the Guzzle client, and you’ll get your subset of the rows. If you’re not using the Drive api to list sheets, just delete that scope from your code. If you are trying to use it, make sure that you’ve enabled it in the Developer Console also. You don’t need the Drive API to read and write to Google Spreadsheets — just to create new spreadsheets or read a list of all of the ones you have. Excellent! Thanks for letting me know what worked. I’ve tried each one of these examples, and none of them return just the rows where ‘county’ equals ‘Sonoma’. All of them return all rows. The last one also gave me warnings about gsx:county being undefined. I have tried different cacert.pem but It didn’t work and got cURL 77 every-time. What should I do now? From what I understand, error 77 indicates that php couldn’t find or open the cacert.pem file. Make sure you’re editing the correct php.ini, and if you’re on an OS like linux or Mac OSX, make sure that the permissions are set properly so that the process that runs php can read the file. the parameters updated-min and updated-max are not supported in the list feed. do you know of any other way to query /feed/entry/updated? No, I don’t. I would grab the whole sheet and filter in my code, but I don’t work with sheets that have more than a few thousand rows. Thank you a lot, Karl. Hi, Karl. Sorry for my bad English. Have you encountered with retrieving data from sheets with limited access . For example using OAuth2.0 check the user token , if he has access to this sheet displayed data sheet, else displayed messege “access denide”. I installed without problems google OAuth2 in hosting , but associate it with the document identifer (ID file), i dont know. I always use a service account, and I give the service account edit access to the sheet. So I have not seen that problem (if I am understanding you correctly). I just re-downloaded the Google API PHP client to make sure that they didn’t change anything, and my code still works for me. Looking at Google’s client.php line 835, I’m guessing that either your json file is malformed, missing, or can’t be found. What should i do now? no idea how to solve it. When I google that, one thing that comes up is that you need at least PHP 5.5 (try php -v). I wanted once again to thank you for your help. The project finally went live today. See: http://cleanpowerexchange.org/california-community-choice/. Click on the various California counties. The client manages all that data in a google spread sheet. In the WP dashboard, I defined a custom post type called CA County and each record of which contains the data for a county. On the backend they are able to select individual counties and then do a bulk refresh of those counties, which pulls the data from the spread sheet. Clicking on a county does an ajax call to get the county data and populate the popup. I have followed all steps given by you and created apitest.php file. When I try to run & debug it, It calls this apitest.php twice. We have also tried to exit from this script but It still run this script again after exit(). But $httpClient->request method does not exist in this class. It has createRequest() method. Can you pls guide us to solve this two issues? We are not able to do any operation with this script. Many thanks for your script! Could you tell me please is there anyway to add a row with google API to new spreadsheet which wil contain dropdown list with one selected value ? What should I put in gsx attribute (example below)? You’re talking about data validation, and I’m not sure how to do that with this type of script. This is what I would try: use your web-based script to add a simple row with the value that you want. Then add a Google Apps Script to the spreadsheet (via Tools – Script editor) that watches for changes to the sheet (via a trigger) and adds the validation to new rows. The way I see it, the validation is just there for people who interact with the script directly, since the web-based script can do its own validation so that it never adds a disallowed value. Very nice, Greg! Thanks for sharing the final product. I haven’t seen those things happen. I’m wondering if there’s a mix of incompatible versions in the dependencies. Did you use Composer to install the dependencies? What OS are you running this on? 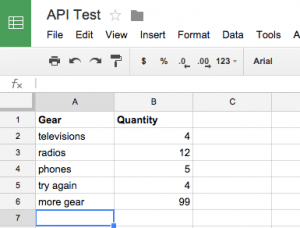 Thanks for sharing this useful article with me, now Google Sheet API work fine for me. I have not done that, but it looks like the API supports it. Please look at this page:https://developers.google.com/google-apps/spreadsheets/worksheets#add_a_worksheet and look at the HTTP example. You should be able to adapt my example code to make that work. How do i insert a new row after specific number of row for example if my spreadsheet is full till 45 row and i want to insert a new row on row number 56 . How do i do that i have followed this https://developers.google.com/google-apps/spreadsheets/data#fetch_specific_rows_or_columns but its not giving me any result . It is just adds a new row wherever it finds first empty row . It might not be possible with the Sheets API, since it tends to work in the populated data area or the following row. Have you tried sending a PUT request with R56C1 and cell row=”56″ col=”1″ like in the “Change contents of a cell” section of that page? God Bless you abundantly Brother Karl! This is a great blessing to us! Make sure that you named the json file “service-account-credentials.json” and put it in the same folder as your script. It sounds like the script can’t find that file. So this is the right file? and how make the extends ? I don’t know what is causing that or what to try. I wonder if Google changed the API client again. I will run some tests, but I can’t do it for a few days. It might be possible I passed throught lot of errors before being stuck on this one. I tried a require to include the file Collection.php but that not worked. This is great! It took me a while to figure out that it doesn’t work with PHP 5.3 or PHP 5.4, so you may want to edit the article to mention that. I had to upgrade to PHP 5.5 to get it working. Thank you, Stan! I probably only tried with PHP 5.5 and didn’t even realize that. Stan just pointed out that these instructions don’t work with PHP versions before 5.5. Maybe that’s your issue? Yes but I already upgraded my php version to 5.5 last week to make it work but it didn’t resolve all problems. Good news Karl ! I tried the installation on my personal computer on Debian 8 and it worked fine ! Maybe it’s windows that messed up everything on the install on my other pc. I just made this “library” based in your work: https://github.com/maparrar/google-spreadsheet-php. Check it if you want. You are free to share and improve :), is MIT License. This example allow get all rows of a spreadsheet or a range of cells. You can pass a range in this format: “A3:F9” . There is a demo in: https://project-spreadsheet-php.herokuapp.com/ that load info from this spreadsheet: https://docs.google.com/spreadsheets/d/154jr-yjqKuBofulfipptUDqx-sTea6sOL5EdOunJMb0/edit#gid=0. Good idea! I will try it sometime soon and let people know about it. I have seen that error before, but can’t remember what triggered it. Are you trying to add a row to a simple spreadsheet that has a single header row? Can you communicate via Skype? mani619cash is my skype. Your help will be really appreciated because I really need this done. I have figured solution for “400 Bad Request` response: Blank rows cannot be written; use delete instead.” error. Then in your Google Spreadsheet, YOU MUST HAVE name,email,password are the values in FIRST ROW of your spreadsheet. Great! Also, I have always had to send valid XML as my $postBody. I usually dump the spreadsheet with a GET and then model my POST body on the data that I get back from Google with the GET. Can we add multiple rows using single POST request? I am faacing above error. I am not understanding what I am doing wrong. I’m not sure what would cause that. Maybe Google updated their PHP API client again and my code needs to be updated. I’ll try it out in a few hours and see if I can recreate the error. I have updated my dependacies. But still I am facing a same issue. I’m sorry, I don’t know what would cause that error. Thanks for the excellent overview and examples. I’ve successfully been able to query one Google sheet, but moving onto a second (a Google Forms response collection sheet) is proving to be a problem. Any idea whether Sheets generated by Forms are not accessible through the methods you’ve described? It shouldn’t be a problem. Try referring to the column as gridid. If that doesn’t work, do a complete GET of the spreadsheet and examine the XML response to see what the column is called in the XML. Google usually converts that column name to all lowercase with no underscores. I’m getting below error not sure what is wrong. Help appreciated. Did you save the json credentials file as service-account-credentials.json in the same directory as the script? If not, you’ll need to edit the script so that it can find your credentials. Thanks again. You’re right — was able to access a sheet created via Google Forms data collection. I had skipped directly into section 6 of your sample code (parsing table data) based on previous success, and should have first checked the different URLs exposed in section 2. Had to manipulate the final URL a little bit, but it’s given me exactly what I needed. Appreciate your help. Excellent! Glad to be of help. I try insert data in sheets. section 4. I’m not sure what would cause that. Have you used sections 2 and 3 to read data successfully? yes. i checked sections 2 and 3. Work ideally. Only 4 section errors. Do you mean that the errors are gone? Maybe it was the version of PHP in XAMPP. still does not work. What version php i must use? i check script at php version 5.4 and 5.5. Not work. Only section 4 not work. i test this code in 2 different PC with different versions php. I can’t understant what problem. I find where i make mistake. In SpreadSheet A1 must be “Gear” and B1 must be “Quantity”. Thank You Karl for your answers. I’m glad you figured it out! I am at a camp where I don’t have a good Internet connection. Many thanks for your guide Karl, I’ve been struggling with this all day. A quick question for you about response times. I’m attempting to develop a website for a local business, and during testing I’m hosting the website on my laptop. I’ve noticed that there is a small lag when I load locally hosted pages that rely on the Google Sheets API for content. In your opinion, will a Google API cause noticeable lag when the website is hosted properly (eg. by a service like GoDaddy)? I’m not sure. I’ve only used web sites to post data to a Google Sheet, and haven’t designed a page that displays data that it gets from a sheet. I’m not sure. Is your PHP version at least 5.5? And does the path to autoload.php in line 6 make sense? Thanks for this script. I am able to get metadata, but when I tried to execute section 2 and so on i am getting error as => Call to undefined method GuzzleHttp\Client::request(). Please can you help me with that..
Is your PHP version at least 5.5? That’s great to hear — good work! I have not seen that error, but it sounds like the etag that you’re sending with the update doesn’t match what’s in the sheet. Maybe someone else or another script has already edited the row since you read it? I want to access the list of available google drive spreadsheets by using drive api. But while running apitest.php i faced some errors. The issue was with the path for. json file. How can I get the list of the available spreadsheets inside my google doc in a php array. I’ve tried this solution but i didn’t figure out. Any ideas to figure out ? Thank you for the update about v4. Sorry, I’ve been away. What OS are you using? Hi Karl, thank you for your reply. My system is: Linux webm408.media.ha.ovh.net 4.4.67-ovh-vps-grsec-zfs-classid #1 SMP Thu May 11 18:47:35 CEST 2017 x86_64. Have you looked at the Google documentation at https://developers.google.com/sheets/api/quickstart/php ? They provide some PHP example code now. I’m sorry that I haven’t gotten back to you. My best guess is that the path to the credentials file might need to be specified differently. Maybe switch from an absolute path (starting with a slash) to a relative path or vice versa?